Executive Director of Sustainability Kathleen Merrigan hosts open class on the restaurant industry’s role in sustainability. Chef José Andrés said that a sustainable food system will start with changing one dinner at a time. When world-renowned chef and activist José Andrés began his restaurant career in the United States after a stint in the Spanish Navy, he started with tapas, the small plate dishes popular in Spain. At the time, small plates were not the fashion, and he received complaints about portion size— “a lot of complaints,” he laughed. But recently, he was vindicated when the United States Department of Agriculture’s dietary guidelines began championing smaller portions. Mr. Andrés said that the Choosemyplate.gov “iconic plate image” also has promoted the importance of eating a diet that is “50 percent vegetables and fruit.” But where are those crops grown and who has access to them? Does the current policy encourage biodiversity in farming? How can we regulate consumption and our resources? The bottom line: Nutritional policy doesn’t equate to sustainability policy, but they are intricately connected. “Why does ‘Choose My Plate’ support eating 50 percent vegetables every day, but the Farm Bill only supports a small percentage of the agriculture behind it?” Mr. Andrés asked rhetorically. Mr. Andrés was among the D.C. food industry insiders who gathered Tuesday evening at the George Washington University Jack Morton Auditorium for the open session of “The Sustainable Plate,” an interdisciplinary undergraduate course organized and co-taught by GW Executive Director of Sustainability Kathleen Merrigan and four other GW faculty members. The event was hosted by the GW Food Institute. 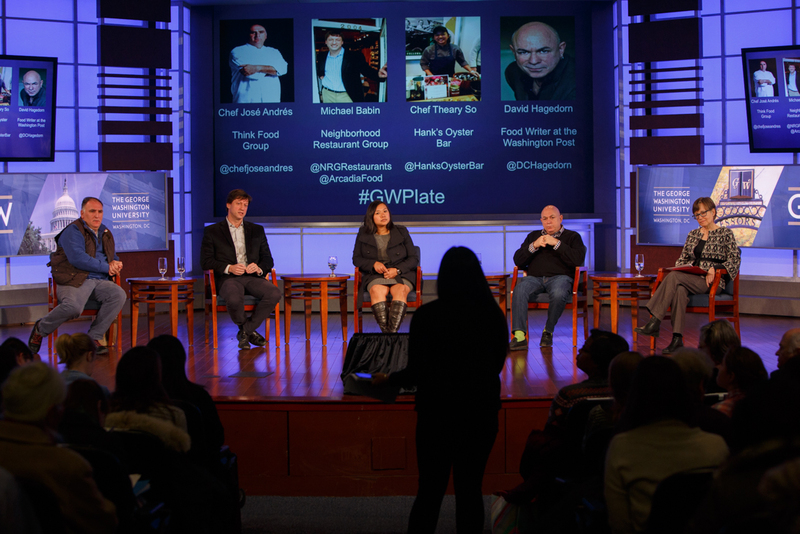 GW President Steven Knapp introduced Mr. Andrés, who was joined on stage for a panel discussion by Neighborhood Restaurant Group Founder Michael Babin, Hank’s Oyster Bar Chef de Cuisine Theary So and Washington Post food writer David Hagedorn. The evening was moderated by Dr. Merrigan and GW Associate Professor of Writing Abby Wilkerson. Chef José Andrés, Neighborhood Restaurant Group Founder Michael Babin, Hank’s Oyster Bar Chef de Cuisine Theary So and Washington Post food writer David Hagedorn with moderator Abby Wilkerson, GW associate professor of university writing. Panelists dived into the complexities of building a sustainable food system and the responsibilities of restaurants in the process. George Washington Today reporter Brittney Dunkins compiled the top three discussion highlights. “Local first” has long been a rallying cry among foodies with an investment in sustainability, but panelists say that buying local is not only difficult but can be detrimental to the food system. For Mr. Babin, sourcing meat locally for the Neighborhood Restaurant Group’s Red Apron butcher shop was impossible once they decided to only purchase from factories that were “animal welfare approved,” a guideline developed in 2006 that is pro pasture-based livestock farming. The situation Mr. Babin describes is an example of why the restaurant industry should be “pragmatic local,” according to Mr. Andrés. Panelists also identified the effect of food trends as a challenge for restaurateurs who want to meet customer demand, construct a unique menu and build relationships with farmers. As a food writer, Mr. Hagedorn said that he watches trends cycle through menus—from brussels sprouts to cauliflower and sunchokes—but chefs have the power to drive trends that can support sustainability goals. “Putting blue catfish on the menu is a great example because they are an invasive species that is only increasing in number,” Mr. Hagedorn said. “Sustainability is not necessarily what drives people, but it could be. Mr. Andrés added that even trends that appear to have a positive effect can do harm when they are applied on a large scale. For example, following the 2010 earthquake in Haiti, the United States provided free rice to feed those who were displaced during the disaster. Since rice is a main crop staple in Haiti, the prolonged generosity of the United States became a burden on its economy, Mr. Andrés said. “We thought we were helping and ended up putting those local rice farmers out of business, so they ended up in the same tent cities in Port-Au-Prince as the people we were feeding,” Mr. Andrés said. A running theme of the discussion was the interconnected nature of the food system. While the public views agriculture, environmentalism, sustainability, consumption and the restaurant world as siloed, panelists said that they often find themselves at the intersection of these systems. For example, since Hank’s Oyster Bar traffics in oysters—one of the more sustainable types of seafood—Ms. So has seen the benefits of farm-raised seafood, which often gets a bad reputation in the food community. According to Mr. Andrés, the only solution to the misconceptions about the food system is continued education and engagement with food at all levels. “Doing good is not enough, we need to start doing ‘smart good,’” Mr. Andrés said.